Any sake with even a tad of distilled alcohol added is taxed by USA authorities at distilled beverage rates, making it unfeasible to import and distribute non-junmai sake. Thus, the brewers introduced at this site do not, at this time, sell any non-junmai sake in the USA. In general, there are five basic types of sake. Each requires different brewing methods and a different percentage of rice milling (seimaibuai). 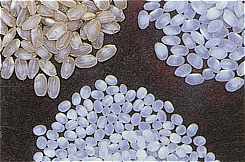 In the photo, for example, the rice at top left is unmilled, the grains at top right are 30% ground away, and the kernels at the bottom are 65% ground away. Naturally, there are other special brewing techniques that are less common, but here we present only the five main types. Click a type to jump to its profile. NOTE: Until recently, at least 30% of the rice used for Junmai sake had to be milled away. But the laws have changed, and Junmai no longer requires a specified milling rate. Nevertheless, the amount milled away must, by law, be listed somewhere on the label. The first four categories above are known as Special Designation Sake, or Tokutei Meishoshu. Each of these has a general flavor profile based on the brewing methods employed. However, there is a whole lot of overlap between them. Very very often one cannot tell which type one is drinking, for some of these sake taste above their class (or just different) and others don't live up to the billing (or are just different). So many things come into play -- rice, water, skill of brewers -- that it is next to impossible to isolate how a sake will taste based on which "type" it is, nor to fault it when it doesn't fit the mold. Nonetheless, generalities can be useful. So enough with the disclaimers and let's move on to our definitions. Honjozo is sake wherein a small amount of distilled pure alcohol is added to smoothen and lighten the flavor, and to make the sake a bit more fragrant. Honjozo often makes a good candidate for warm sake. Honjozo-shu, like Junmai-shu, must be made with rice with a Seimai Buai (degree of milling) of at least 70%. This is the number you will see on the label (if it is given at all), but what it means is that the rice has been polished so that no more than 70% of the original size of the grains remains. In other words, at least 30% of the outer portion of each rice grain has been ground away. Honjozo sake is often a bit lighter than other sake, due to the small amount of grain alcohol added at the end of the ferment. Remember that this is not a bad thing, in moderation, and brewers have been doing it for hundreds of years. It is NOT simply a cost cutting measure when used within the limits prescribed by honjozo. The flavor is lighter, and magically the fragrance becomes much more prominent. Below is a typical honjozo sake. Junmai refers to pure sake, pure in the sense that no adjuncts (starches or sugars other than rice added to the fermenting mixture) were used, and that no brewer's alcohol was added either. Junmai-shu, like Honzojo-shu, must be made with rice with a Seimai Buai (degree of milling) of at least 70%. This is the number you will see on the label (if it is given at all), but what it means is that the rice has been polished so that no more than 70% of the original size of the grains remains. In other words, at least 30% of the outer portion of each rice grain has been ground away. Junmai often has a fuller, richer body and a higher-than-average acidity. The nose is often not as prominent as other types of sake, nor are other parameters dependent on whether a sake is a junmai or not. Here is a typical junmai-shu flavor profile. NOTE: The laws have changed, and Junmai no longer requires a specified milling rate. Nevertheless, the amount milled away must, by law, be listed somewhere on the label. Ginjo sake is much more delicate and light and complex than the above two. Why? The rice has had the outer 40% of the grains polished away, leaving the inner 60% left. This is opposed to leaving 70% for junnmai and honjozo. On top of that, special yeast, lower fermentation temperatures, and labor -intensive techniques make for fragrant, intricate brews. Here is a typical ginjo chart. Daiginjo is fundamentally speaking an extension of ginjo. The rice has been milled so that no more than 50% of the original size of the grains remains, although this often goes to 35%, and even more care has been taken to create sake representative of the pinnacle of the craft. Although there is a range of styles of daiginjo, and not all look like the chart below, here is a somewhat typical example. The above tasting chart is applied to each sake sold at eSake.com, and will hopefully come into more use worldwide in the future. Namazake is sake that has not been pasteurized. It should be stored cold, or the flavor and clarity could suffer. Namazake has a fresh, lively touch to the flavor. All types of sake (junmaishu, honjozo, ginjo-shu, and daiginjo-shu) can be namazake, or not. Some ginjo-shu and daiginjo-shu are also junmai-shu. So a junmai ginjo-shu is a ginjo-shu with no added ethyl alcohol. If a ginjo or daiginjo is not labeled junmai, then the added alcohol is limited to the same small amounts as honjozo. Nigori-zake. Sake that is unfiltered. Seishu. The legal name for sake, differentiating it from other alcoholic beverages. Futsuu-shu. Any sake that is not junmai-shu, honjozo, ginjo-shu or daiginjo. Jizake. Vague term that usually means sake from smaller breweries out in the boonies; sake that is not mass-produced. For more definitions, please refer to eSake's Sake Glossary. Honjozo-shu must be made with rice with a Seimai Buai (degree of milling) of at least 70%. This is the number you will see on the label (if it is given at all), but what it means is that the rice has been polished so that no more than 70% of the original size of the grains remains. In other words, at least 30% of the outer portion of each rice grain has been ground away. Junmai-shu no longer requires a specified milling rate. Nevertheless, the amount milled away must, by law, be listed somewhere on the label. Ginjo-shu, whether Junmai Ginjo-shu or non-Junmai Ginjo (usually called aru-ten ginjo, one does not say Honjo Ginjo) must have a Seimai Buai of at least 60%, meaning that the outer 40% or more has been polished away. Daiginjo and Junmai Daiginjo (same phraseology rules apply here) must be made with rice with a Seimai Buai of 50% or more, meaning at least the outer half has been ground away. Often, Daiginjo goes as far as a 35% Seimai Buai. What happens to the powder (called nuka) that is ground away? It is often used in Japanese-style cakes, for livestock feed, and can also be fermented and distilled elsewhere in a separate process. Nothing is wasted. Remember, adding alcohol does not make a sake lower grade; it is part of one manner of brewing that produces specific results (like lighter, more fragrant sake with a more robust structure and perhaps longer shelf life). There are junmai purists, but there are those who feel adding alcohol is the correct way to brew, as is indicated in old brewing texts.